Rental gear and prices available through Hefti Sports (Swissrental) are shown in the chart below. Ski touring (a.k.a., alpine touring, randonner): Boots: 19chf/day. Skis: 48chf/day. Skins: 15chf/day (skins are not on the price list below). TOTAL for ski-touring outfit: 82chf/day. Most of their ski-touring gear has tech bindings (i.e., pins). They have at least 2 pair of skis with bindings that can take regular ski boots. Subtract 10% when renting on your LAS account. Other gear: Snowshoes: 19chf/day. XC gear (set) classic: 28chf/day; skating: 38chf/day. Mountaineering boots: 19chf/day. Subtract 10% when renting on your LAS account. Hefti’s phone in Leysin is +41 24 494 1677; heftisports@swissrent.com. Hours: 8:30-18:30, 7 days/week. In Les Mosses it’s: +41 24 491 1567; heftisports@swissrent.com. Hours: 09:00-17:30, 7 days/week. 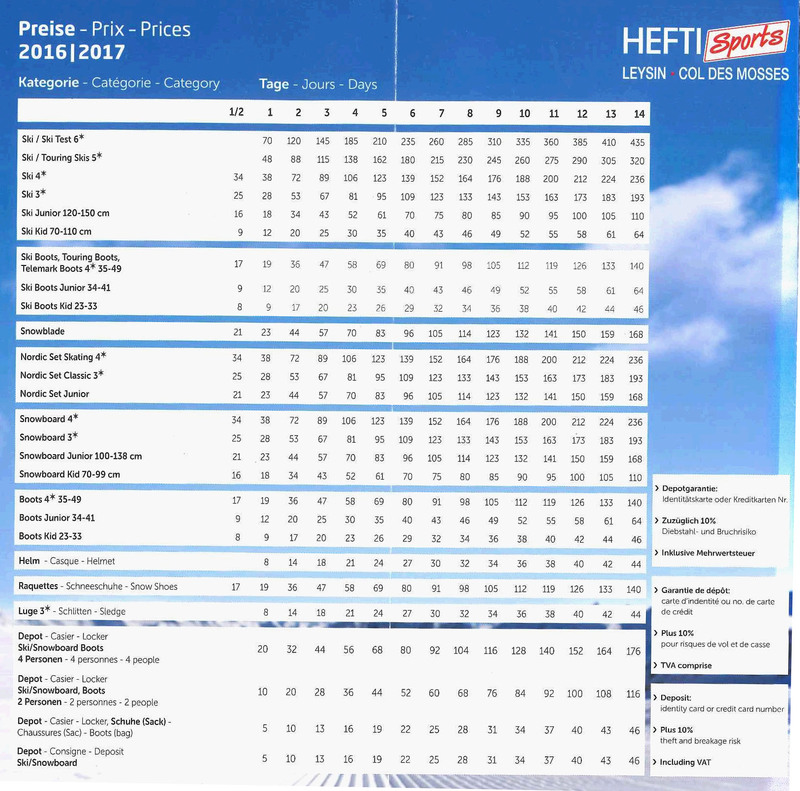 Rental prices Winter 2016/17 at Hefti Sports (Swissrent). Inventories of Alpine Club (including International Award) gear are being kept on Google Sheets (only visible to LAS accounts). Alpine Club Equipment (Mat). This is the current version of our equipment inventory. AC – Alpine Club / IntAward Equipment Inventory (John). This is the original equipment inventory from 2015. We should continue with the improved version created by Mat (see above).